The Routledge Encyclopedia of Film Theory is an international reference work representing the essential ideas and concepts at the centre of film theory from the beginning of the twentieth century, to the beginning of the twenty-first. When first encountering film theory, students are often confronted with a dense, interlocking set of texts full of arcane terminology, inexact formulations, sliding definitions, and abstract generalities. The Routledge Encyclopedia of Film Theory challenges these first impressions by aiming to make film theory accessible and open to new readers. Edward Branigan and Warren Buckland have commissioned over 50 scholars from around the globe to address the difficult formulations and propositions in each theory by reducing these difficult formulations to straightforward propositions. The result is a highly accessible volume that clearly defines, and analyzes step by step, many of the fundamental concepts in film theory, ranging from familiar concepts such as ‘Apparatus’, ‘Gaze’, ‘Genre’, and ‘Identification’, to less well-known and understood, but equally important concepts, such as Alain Badiou’s ‘Inaesthetics’, Gilles Deleuze’s ‘Time-Image’, and Jean-Luc Nancy’s ‘Evidence’. 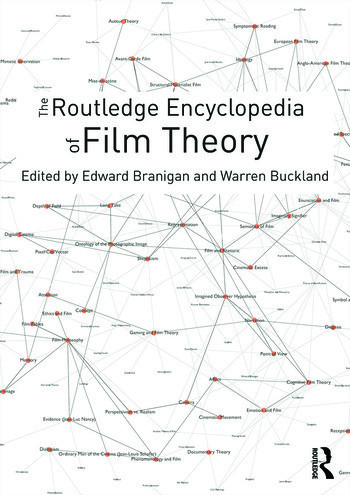 The Routledge Encyclopedia of Film Theory is an ideal reference book for undergraduates of film studies, as well as graduate students new to the discipline. Affect. Anglo-American Film Theory. Apparatus Theory (Baudry). Apparatus Theory (Plato). Art, Film as. Attention. Attraction. Auteur Theory. Blending and Film Theory. Brecht and Film. Camera. Cinematic Movement. Classic Realist Text. Classical Film Theory. Close-up. Cognitive Film Theory. Concept. Contemporary Film Theory. Counter Cinema. Depth of Field. Dialogism. Diegesis. Digital Cinema. Documentary Theory. Emotion, Film and. Enunciation. Ethics. European Film Theory. Evidence (Jean-Luc Nancy). Excess, Cinematic. Fantasy and Spectatorship. Feminist Film Theory, Core Concepts. Feminist Film Theory, History of. Film Fable (Rancière). Film-Philosophy. Formalist Theories of Film. Gaming and Film Theory. Gaze Theory. Genre Theory. Identification, Theory of. Ideology. Illusion. Imaginary Signifier. Imagined Observer Hypothesis. Inaesthetics (Badiou). Interface. Long Take. Memory and Film. Mimetic Innervation. Minor Cinema. Mise en Scène. Modernism versus Realism. Montage Theory I (Hollywood). Montage Theory II (Soviet Avant-Garde). Movement-Image. Narration. Ontology of the Photographic Image. Ordinary Man of the Cinema (Schefer). Perspectivism versus Realism. Phenomenology and Film. Pixel/Cut/Vector. Poetic Cinema. Point of View. Postmodern Cinema. Queer Theory. Reception Theory. Redemption. Representation. Rhetoric, Film and. Seeing/Perceiving. Semiotics of Film. Skepticism. Sound Theory. Specificity, Medium I. Specificity, Medium II. Structural/Materialist Film. Suture. Symbol and Analogon. Symptomatic Reading. Third World Cinema. Time-Image. Trauma. Voice. Edward Branigan is Professor Emeritus in the Department of Film and Media Studies at the University of California, Santa Barbara. He is the author of Projecting a Camera: Language-Games in Film Theory, Narrative Comprehension and Film, and Point of View in the Cinema: A Theory of Narration and Subjectivity in Classical Film. With Charles Wolfe, he is the general editor of the American Film Institute Film Readers series. Warren Buckland is Reader in Film Studies at Oxford Brookes University. His areas of research include film theory (Film Theory: Rational Reconstructions, 2012 and The Cognitive Semiotics of Film, 2000) and film narratology (Puzzle Films: Complex Storytelling in Contemporary Cinema, 2009 and Hollywood Puzzle Films, 2014). He is editor of the quarterly journal the New Review of Film and Television Studies.